The Benebone Peanut Butter Flavored Dental Dog Chew Toy is a flavor-filled dental chew that dogs can’t wait to sink their teeth into. That’s because the entire toy is infused with natural peanut butter flavor that comes from real peanuts. 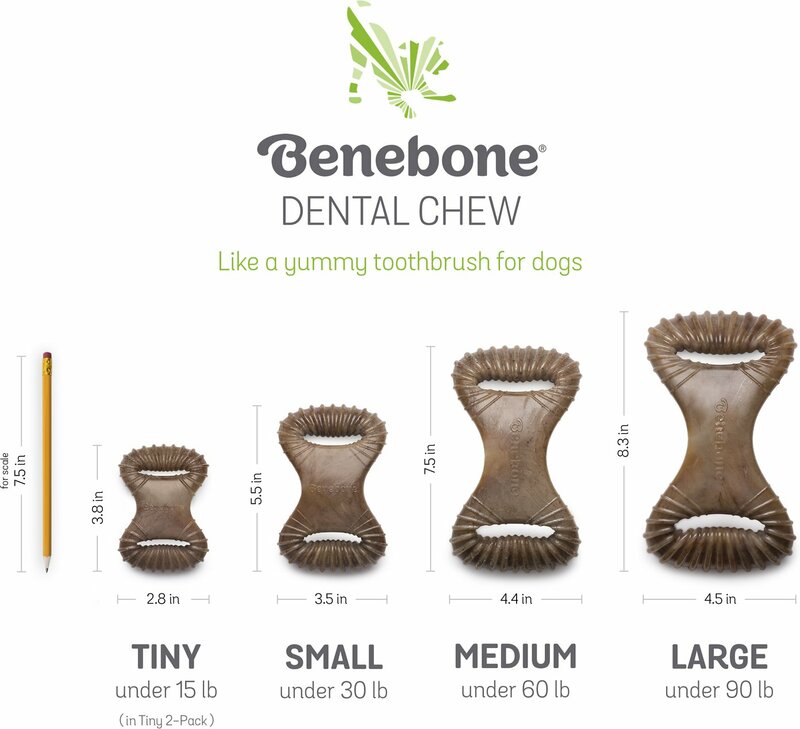 This super-strong dental chew is made from a durable nylon material and features deep grooves on each end to help clean your dog’s teeth as he chews. The curved design lets him flip up one end by holding down the other end with his paws so he can settle in for a serious chewing session. Made of super-strong nylon and designed with patented ridges that are great for removing plaque and tartar as your pal chews to his heart's content. Made with real, peanuts and is 100% free of artificial flavors. 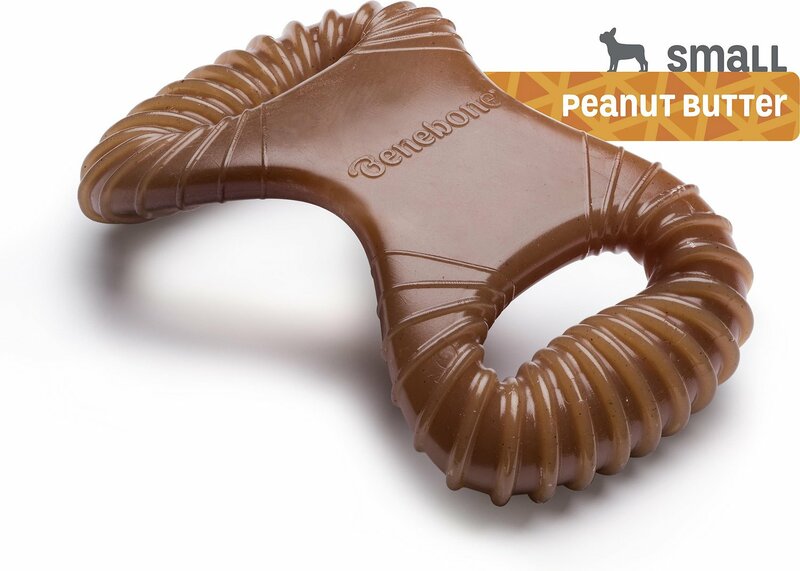 The ergonomically curved design allows your pup to get a good bite. Proudly made in the USA including packaging, ingredients, tooling and all materials. Benebone is a brand you can feel good about since they are dedicated to the welfare of dogs through community involvement and product donations. Our baby girl Tally LOVES Benebones. I especially like them because they're extremely durable, but also soft enough that I'm not concerned she's going to crack a tooth. I've found our old lab stealing it from her, even though he hasn't ever had an interest in bones in his entire life! Must be tasty! My dog loves Benebone bones usually. This one is the exception. I'm not sure if it's the shape which is awkward or the flavor. This is now my second benebone and I couldn't be happier. I used to buy another brand that my dog liked but once I have gotten the benebones she ignore them. I got a regular size for my dog that is 53lbs and it is perfect. 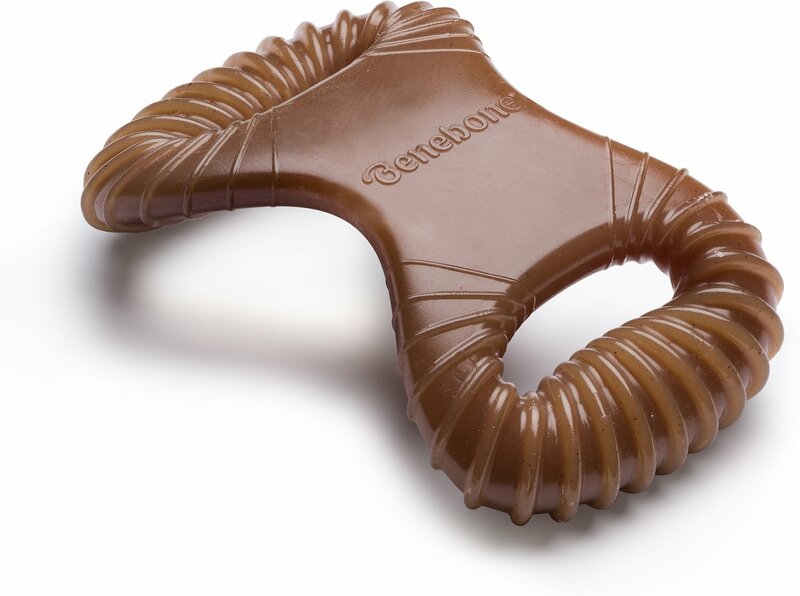 I like this type better than the wishbone style as my dog has an easier time chewing on the whole toy rather than just the knobs at the end. It also seems to be a little more sturdy, so I don’t get worried leaving it with him while I’m away where as I locked up the other style so he wouldn’t gnaw the ends off. This is a really well-made chew toy. I like that there are different sizes and flavors. However, I bought this before finding out that my dog is not a fan of chewing hard objects. You can tell that the quality is above average. I think a lot of other dogs would like this product so that is why I am recommending it. I bought this for my puppy. She loves it.... My other little dogs decided they like them too so, we had to get more. The only flaw in these is that they are like stepping on Legos on steroids... So watch where you're going. both our smaller schipperke/ chihuahua and our larger APBT terrier love these bones from this brand. they last foreveeeeerrr and they seem to enjoy the flavors. we've spent a few years buying this brand and will continue to do so. I don't give Genny real bones. I tried the Benebone and she loves it. She chews on it quite a bit and I feel safe that she won't get any fragments caught in her throat. Would definitely purchase this item again. My dog loves these bones but this shape wasn’t her favorite. She prefers the wishbone shape. She gnawed on the wishbone until the ends were gone. This is the only thing my dog hasn’t completely destroyed in 15 minutes or less. It keeps him busy for a long time!